SAMe is essential to the manufacture of many important brain compounds such as neurotransmitters and phospholipids, which are critical for maintaining healthy mood and emotional well-being. Clinical studies indicate that SAMe may play an important role in the manufacture of cartilage and that SAMe helps produce proteoglycans, essential components in healthy joint and mobility. SAMe is involved in many processes of the liver. SAMe is essential to maintaining glutathione levels, which is critical for proper liver function. As people age, SAMe levels can decrease. SAMe supplementation may be an important factor in maintaining mobility, and a healthy body and mind. NutraLife SAMe is the same form that has been available in Europe for over two decades. 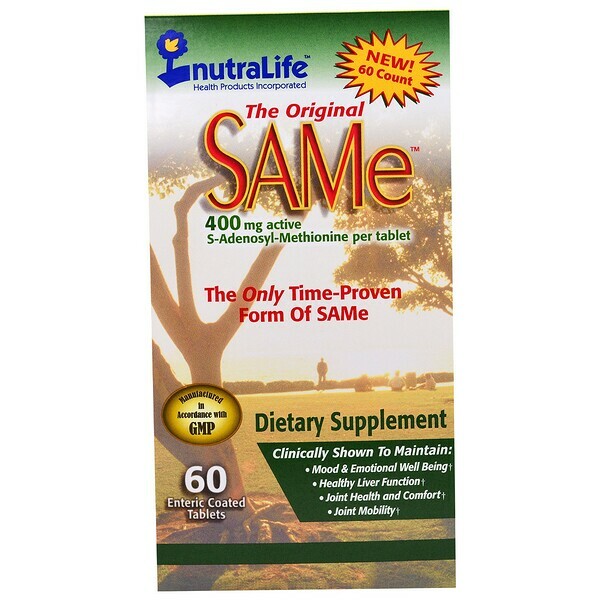 NutraLife offers the only form of SAMe with 20 years of historical data for both effectiveness and safety. NutraLife SAMe is manufactured and packaged to ensure the highest quality and safety standards. 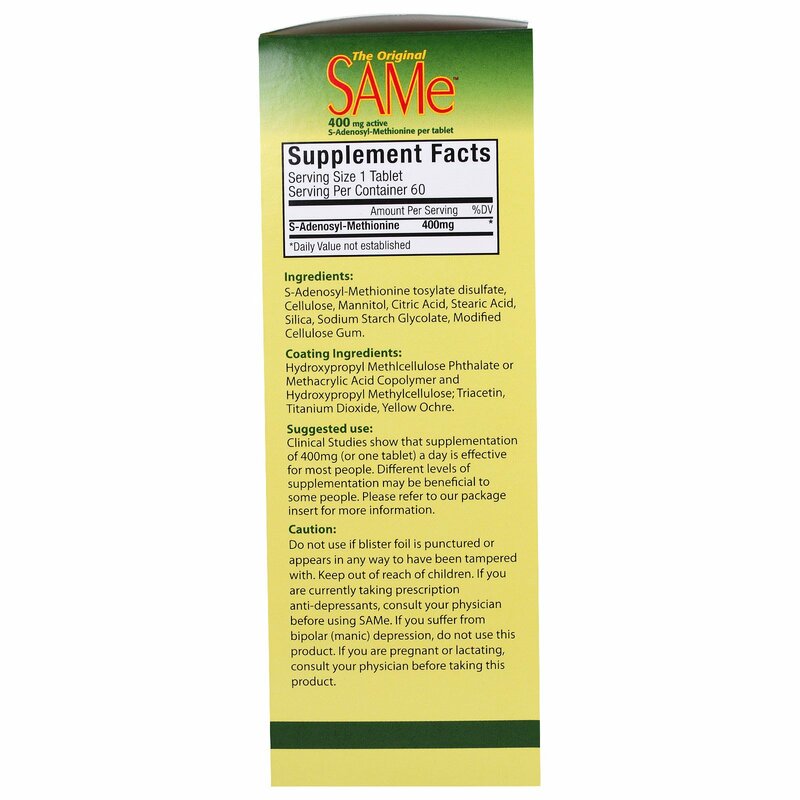 Each NutraLife SAMe tablet contains 400 mg of active S-Adenosyl-Methionine and is manufactured in full accordance with GMP. NutraLife SAMe is the original SAMe brand introduced to the United States almost a decade ago. NutraLife SAMe continues to be made with the highest quality active S,S isomer SAMe raw material. NutraLife SAMe is kosher certified by Star-K and contains NO animal byproducts. NutraLife SAMe does not contain Talc. NutraLife SAMe tablets are manufactured in a carefully controlled environment and are cold form blister packed to ensure a more than two year stability rating. Please consult package insert for more information on NutraLife SAMe. Clinical studies show that supplementation of 400 mg (or one tablet) a day is effective for most people. Different levels of supplementation may be beneficial to some people. Please refer to our package insert for more information. S-Adenosyl-Methionine tosylate disulfate, cellulose, mannitol, citric acid, stearic acid, silica, sodium starch glycolate, modified cellulose gum. Coating Ingredients: Hydroxypropyl methylcellulose phthalate or methacrylic acid copolymer and hydroxypropyl methylcellulose; triacetin, titanium dioxide, yellow ochre. This product contains no peanuts, eggs, dairy, soy, wheat, yeast, gluten, tree nuts, crustacean shellfish, fish or other animal byproducts. Each NutraLife SAMe tablet contains 800 mg SAMe tosylate disulfate, which includes 400 mg of the active ingredient SAMe (S-Adenosyl-Methionine). NutraLife SAMe tablets are sealed in blister packs to ensure product safety, quality and freshness. This product should be stored in a dry, cool place. Do not use if blister foil is punctured or appears in any way to have been tampered with. Keep out of reach of children. If you are currently taking prescription anti-depressants, consult your physician before using SAMe. If you suffer from bipolar (manic) depression, do not use this product. If you are pregnant or lactating, consult your physician before taking this product.